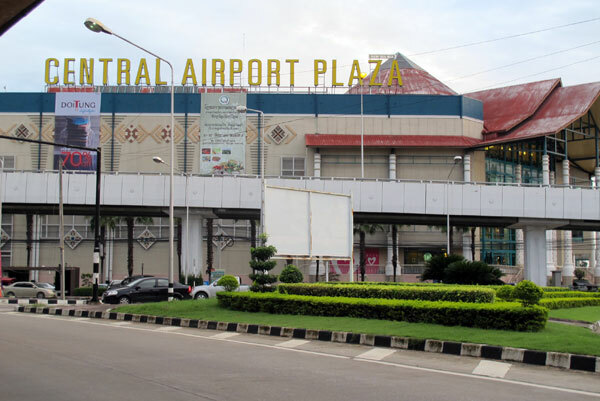 CentralPlaza is the largest shopping and entertainment zone in the north of Thailand. It provides everything you need with the wide collection of foods and goods. Central Plaza Chiang Mai Airport also known as Central Airport Plaza. The shopping mall was established as Tantraphan Airport Plaza in 1987. Central Pattana takeover and re-branded the shopping mall to Central Airport Plaza in March 1996. Central Airport Plaza Chiang Mai is the place to go for international brands and is also a good stop off point for last-minute souvenirs. Located within walking distance of the airport, there are five floors of shops and restaurants as well as an international supermarket and a cinema here. Open during the week from 10:30 until 21:00 and weekends and holidays from 10:00 until 21:30. The highlight for most visitors to Central Airport Plaza Chiang Mai is the handicraft and souvenir section. Boutique shops here sell a range of typically Northern Thai souvenirs including silks, clothing, teak trinkets and traditional toys. Although prices tend to be a little higher than those you find at the markets in Chiang Mai, the quality is excellent. We will be back again this year. I had visited this Mall by chance. just whiling away my time when the free shuttle service landed me there. i was flabbergasted to see all sorts of material. From lowest range to the most called for brands. well maintained, everything of the world available.The home section was tremendous. There I saw things which were very economical and many new things like artificial bushes. best to implant and they look fresh year around.a must visit when you are in Thailand and specifically in Chiang Mai. I have to say when I need an item this is my 1st choice.Each floor is dedicated to a type of shop i.e. Top floor is for the Cinema and restaurants. It has a free bus to the Airport (green) you can walk there.The Cinema aways have at lest one film in English (E).Tops Market is a good place to shop and has it's own food hall. We have Veggie Omelette and Rice 35 baht. Eat in or take away.The major phone networks are here.For the children they have a play area and a small train.